WSF&RS 2009 MAN/JDC Water Tender Ladder. This is one of 2 MAN/JDC water tender ladders purchased this year by the West Sussex Fire & Rescue Service and photographed 24th April,2009 at the new brigade workshops in Chichester. The appliance(reg-HX58 CNU)will be allocated to the fire station in Keymer,the brigades smallest station,and the other MAN/JDC(reg-HX58 CNO)will go on the run as third pump(retained)at Crawley. The brigade specially ordered these 2 machines having Keymer in mind because its such a small old station,but want to get full use out of both and Crawley is a busy station. The new appliance that will go on the run at Crawley will though always be made available to be tranferred to Keymer if and when required due to breakdown/service,etc. Thanks for a good picture Pete, still does not seem right having these MANs and Scanias in West Sussex - looks as if it will be a tight squeeze getting this "reduced size" MAN into Keymers small station - any idea how soon the new appliances will be on the Run, as i did'nt see any whilst back at home in Worthing earlier this week. Added by Jon Godden on 21 May 2009. Do you have any pictures of the new HRTS for replacing the old ones ? Added by Nathan on 31 May 2009. Jon,both have now been fitted out at brigade workshops but will not be going on the run yet until familiarisation of vehicles on stations,and also driver training.It could be quite sometime before they go operational on stations. 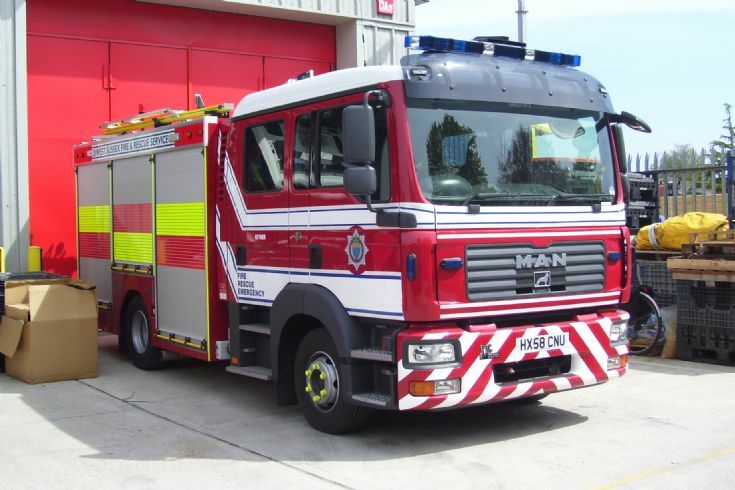 Its hoped to have one of the new Scania pumps,one of the new Man's,and also one of the new Hrt's at the Amberley Fire Show(July 4th&5th),can't see it happening though. Added by Pete Matten on 01 June 2009. Nathan,I do beleave all three new Hrt's have now been delivered to brigade but work on the Man's and other work at Workshops means these will not be on the run for sometime.I understand there at workshops at this time now being fitted out. Photograph:-I have photograph but copyright,but once I get my own shots will forward to the site.My opinion:-They look just like a Scania with a little tool box on the back for the gear,and a crane on the back...UGLY,I say again...Ugly...Marks out of ten-5/10.Pete. Added by Robert Smith on 27 July 2009. Pete if you give the Scania Hrt 5/10 i give this - 5000, this has to be the most ugly appliance ever built ! Added by John Johnstone on 27 July 2009.
may well end up at Worthing as the third pump and used by the Retained(Speculations On going). Added by Pete Matten on 27 July 2009. John,I've looked closely at this appliance and thought compared to Scania's its truly far better.I don't ride the big red trucks now so cannot really pass judgement,but the money thats being spent these days by brigades,I think we'd have been better off staying with DENNIS.At least we were sure of fine workmanship,and appliances that lasted(No further comment). What you said Robert could very well be possible since Shoreham is going to receive one of the new Scania's, meaning the station's Dennis Sabre will be replacing their Dennis Dagger, leaving the Dagger in need of a new home. Added by Danny Chatfield on 27 July 2009. Pete, well said, even though, like me, you dont ride them anymore, keep your comments coming please. Memories of what a machine should be, and nowadays are not are the only way to hammer home the points being made about them. Added by John Stott on 27 July 2009. Pete, do you know the total weight of this appliance and what size/weight chassis it is built on at all please and much larger than a conventional appliance.It looks a compact vehicle. Thanks Paul. Added by Paul Warnock on 27 July 2009. Added by Paul Warnock on 30 July 2009. Paul,I'll be seeing one of the mechanics from workshops this weekend at the Odiham Fire Show, I'm displaying part of my model collection. Hopefully I'll be able to get some information and then get back to you.Pete. Added by Pete Matten on 31 July 2009. Thats great Pete,would like to see any pics you have of your models if poss, dont know if you could send them off group ? Thanks again have a great weekend at Odiham, working this weekend must try and get down there sometime. Paul. Added by Paul Warnock on 31 July 2009. Paul,spoke to Barry(Mechanic-Workshops)at the Odiham Show over the weekend so hoping he'll E.Mail me reference info on the MAN appliance in due course,though he can't make out why anyone would want the info.In his words,they are aload of old ----. Reference my model collection,I don't think anyone on site would be interested in seeing that even though my display this year at Odiham was something a little special(forgot to take pic)and covered some 350 years of the British fire engines-many of course had to be scratch built,in other words,I had to make them. Paul,I'll scan and send direct to you a couple of my pictures I took over the years-Odiham/Amberley and fire station Open days.Pete. Added by Pete Matten on 03 August 2009. Pete, Barry sounds like he knows a thing or two re the MAN .... did he give any reason why they are like they are ? Added by John Johnstone on 03 August 2009.
i know keymer very well and can tell you even though its a tight squeeze a Dennis Dagger WILL just about fit in. Also i have seen the new man sitting in haywards heaths drill yard with their name plate on it ????? Added by Andy Twine on 10 September 2009. Hi guys, I am the Crew Manager for Keymer and to the best of my knowledge we have only had one moan about the new MAN. Their is only 2" each side of the appliance when reversing it into the station. The short time that we have had use of the personnel have been more than happy with the appliance. I also understand their have been problems with this appliance, new rear axle fitted, lighting bar, electrical faults and also the appliance is not a true automatic. Basically it's a manual 12 gear box with servos that operate the gear change and clutch which is computer controlled. One of the resent modifications was to have a padel fitted to the steering colume. This alows the driver to select a manual mode and select what gear he requires. The appliance as you know is one of 2 WSFRS and is fitted with all mod cons including ESP which will have to be fitted by law to all lorrys. Keymer personel are undergoing training at present and we are looking forward to accepting the MAN with in the next month. I will upload some pictures of the MAN in Keymer station taken erlier this year. Added by Neil Pocock on 08 November 2009. Neil,thanks for the latest input into the long saga with the MAN appliances.I do have several pictures I've taken of the MANS at various locations over the last few months,but it will be good to actually see a picture of it at your station.Will it ever go on the run at Keymer remains to be seen,but can you keep us all informed please.Thanks,Pete. Added by Pete Matten on 08 November 2009. Very interesting new truck, Neil; and thanks for the info. What is the ESP, by the way? Added by Pat Rivers-Bowerman on 09 November 2009. The system constantly monitors the dynamic status of the vehicle and then automatically calls on the engine management and brake system to intervene if the truck threatens to tip over or skid, see links. Added by Neil Pocock on 10 November 2009. I have just sent in a picture showing Keymer Fire Station from around 1994,and even back then when they had in use a 1992 Dennis Rapier/JDC Water Tender Ladder,they only just got it into the fire station.The picture though does show a typical rural village retained fire station in the county of West Sussex. Added by Pete Matten on 10 November 2009. Added by John on 21 June 2011.